The client is one of the world's leading insurance companies. In 2007, the client embarked on a journey to transform its actuarial function. 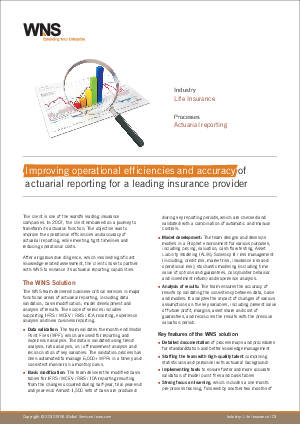 The objective was to improve the operational efficiencies and accuracy of actuarial reporting, while meeting tight timelines and reducing operational costs. This paper explains how the WNS team delivered business-critical services in major functional areas of actuarial reporting, including data validation, basis modification, model development and analysis of results. The scope of services includes supporting IFRS / MCEV / RBS / ICA reporting, experience analysis and new business reporting.